This picture was taken in Bombay, India, in December 2004, on the occasion of the fiftieth Golden Wedding Anniversary celebrations of my parents. 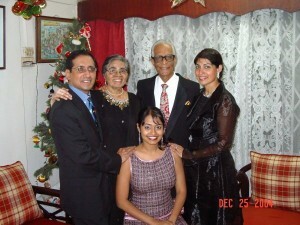 It shows (standing from left), my husband Llew, my parents Edith and Robert D’Souza and myself. Chriselle, my daughter, is seated in front.